The High Line is a public park built on a historic freight rail line elevated above the streets on Manhattan’s West Side. It extends from Gansevoort Street in the Meatpacking District to West 34th Street, between 10th and 12th Avenues. Access: As of 2018, there are eleven entrances to The High Line. The wheelchair-accessible entrances, each with stairs and an elevator, are at Gansevoort, 14th, 16th, 23rd, and 30th Streets. Staircase-only entrances are located at 18th, 20th, 26th, and 28th Streets, and 11th Avenue. Street level access is available at 34th Street via an “Interim Walkway” between 30th Street/11th Avenue and 34th Street. The High Line was built on the abandoned southern viaduct section of a New York Central Railroad line called the West Side Line. The last train ran on that line in 1980. It was then abandoned for 20 years. 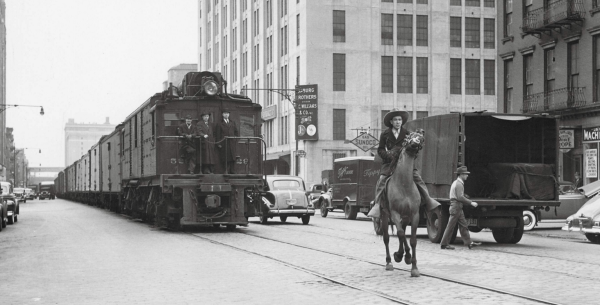 To prevent further accidents, the city built The High Line which opened in 1934 and ran from where Madison Square Garden stands today to Spring Street. 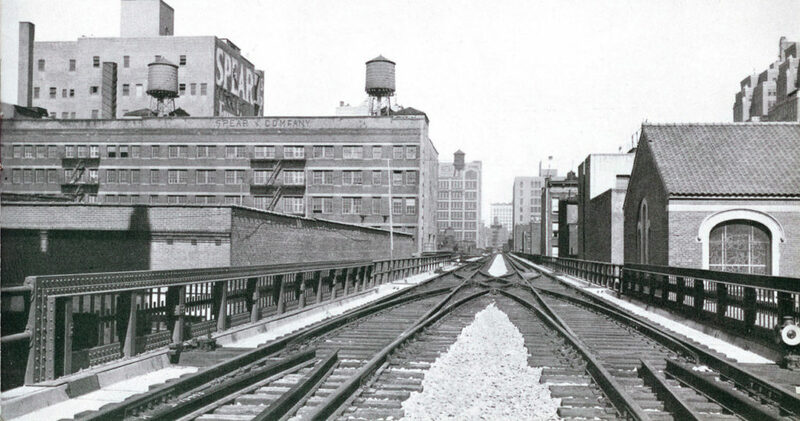 It was designed to go through the center of blocks, rather than directly over the avenue and connected directly to factories and warehouses, allowing trains to roll right inside buildings. As the inner-city railroads became obsolete (mainly due to the expansion of the trucking and air cargo industries), 1980 saw the last train on the West Side Line. It remained abandoned for almost 20 years while wild vegetation completely took over the tracks. 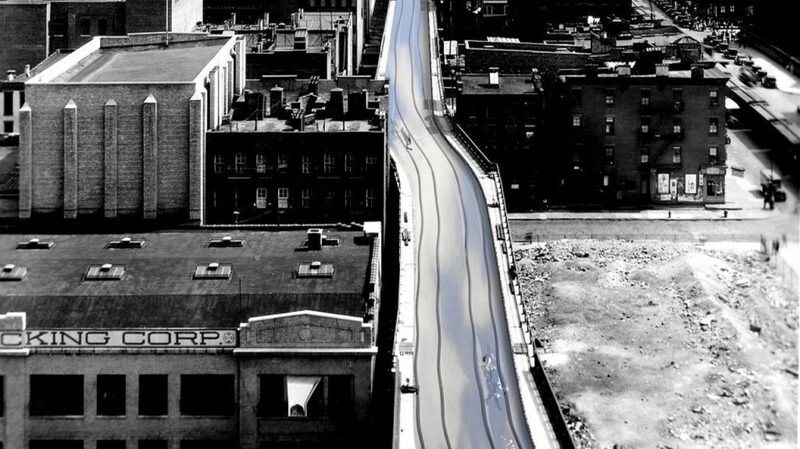 The High Line was slated for demolition under the administration of then-mayor Rudy Giuliani. In 1999, the nonprofit organization Friends of the High Line was formed by Joshua David and Robert Hammond, residents of the neighborhood that the line ran through. They advocated for the line’s preservation and reuse as public open space. 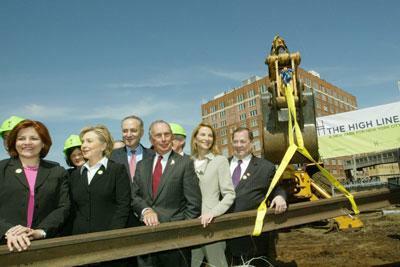 On April 10, 2006, Mayor Bloomberg presided over a ceremony that marked the beginning of The High Line’s construction. 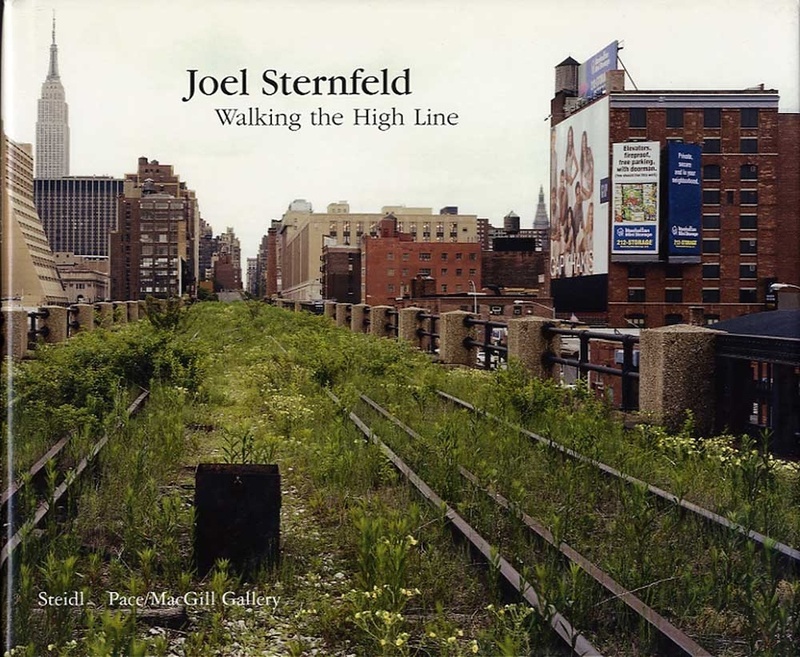 Friends of the High Line raised more than 90 percent of the park’s annual operating budget from private donations. The organization has 80 full-time year-round employees and roughly 150 full-time employees during the summer season. The park’s attractions include plantings that are inspired by the landscape that grew wild on the abandoned tracks, views of the city and the Hudson River, as well as countless cultural events, installations and performances. The trail is made of pebble-dash concrete walkways that swells and constricts, swings from side to side, and divides into concrete tines that meld the hardscape with the planting embedded in railroad gravel mulch. The High Line’s green roof system is designed to allow the plants to retain as much rain water as possible. Also, there is an irrigation system installed with options for both automatic and manual watering. Some of the planting beds are heated underneath to help the plants weather cold winter temperatures. Since the park’s opening, Friends of the High Line has held a licensing agreement with the New York City Department of Parks & Recreation to serve as its primary steward and is responsible for the daily operations and maintenance of the park, which amount to more than $5 million a year. 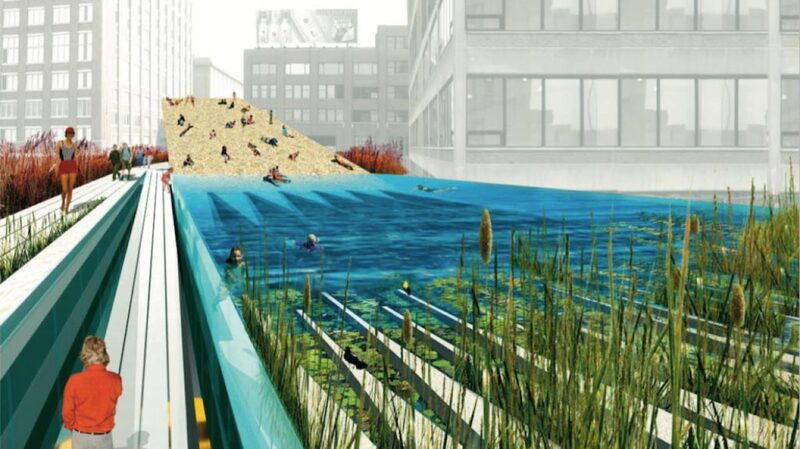 Because of The High Line’s green standards and the delicate pathways, traditional ice-scrapers as well as chemical ice-melting techniques are not allowed. In consequence, some areas of the High Line must be blocked off until the ice melts naturally. To remove snow, the Friends of the High Line staff uses a combination of power brooms, snow throwers and hand shoveling. The project has spurred real estate development in the neighborhoods that lie along the line and majorly increased real estate values and prices along the route. At the Gansevoort Street end is named the Tiffany and Co. Foundation Overlook; the foundation was a major backer of the park. Other major backers included Philip Falcone, Diane von Fürstenberg, Barry Diller, and von Fürstenberg’s children, Prince Alexander von Fürstenberg and Princess Tatiana von Fürstenberg. 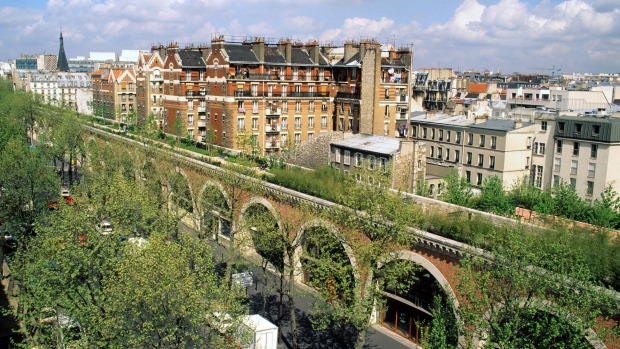 The High Line was named one of the top ten Instagrammed places in the world in 2013. Park rules prohibit “throwing or moving objects of any kind—frisbees, balls, etc”.